ASR-031D (EU) sled, rfid ipad air, read rfid with iphone, iphone read rfid, ipad rfid, rfid jacket, iphone 7 rfid, ASR-030D / ASR-031D of AsReader series is the modular type RFID reader/writer for iPhone 6, iPhone 6 Plus, iPhone 6s, iPhone 6s Plus, iPhone 5, iPhone 5s, iPhone SE, iPod touch 5th and 6th gen, and iPad Air2 and Pro9.7. It is either around 860 or 920MHz UHF band RFID reader/writer and has FCC and CE certification for each model. *Please contact us for your local standard. It can be modified for other countries with firmware updates. LED: Non-blinking Blue LED: Connected with device (*7). Blinking Blue LED: Reading RFID tag. *1 The radio frequency bandwidth can be modified between these levels using software. *2 It may depend on the type of IC tags and operating circumstances. *3 iPhone's battery will last about 4.5hrs/25,000 times continuous reading on iPhone's default brightness setting. At which point AsReader's battery will still have about 50% charge. *4 Standard iPhone 1A charger is strongly recommended to be used when using Magconn cable. 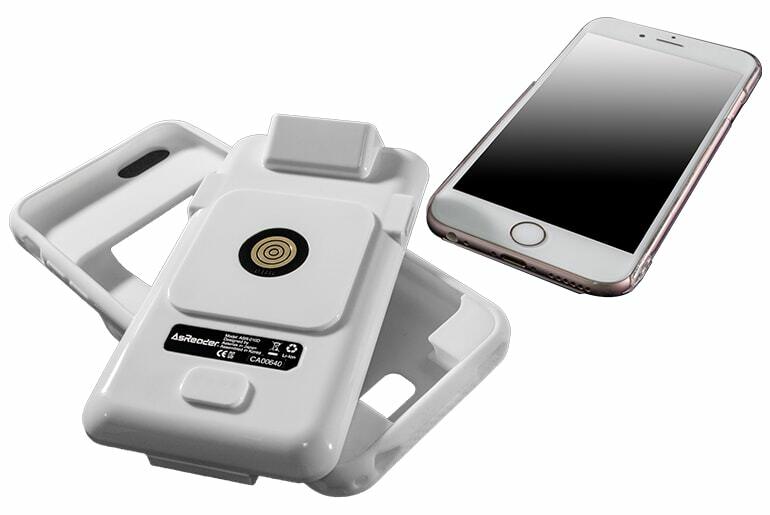 *5 iPhone and AsReader batteries will charge simultaneously. iPhone and AsReader batteries will be recharged in 3.5 hrs and 2 hrs respectively in simultaneous recharging mode. *6 SDK is available for free download. *7 Blue LED will turn on after iPhone/iPod is connected. LED will turn off after the reading the first tag. *8 iPhone screen could be broken, depending on the drop angle. *9 It depends on the case, Please contact us for case availabilities.